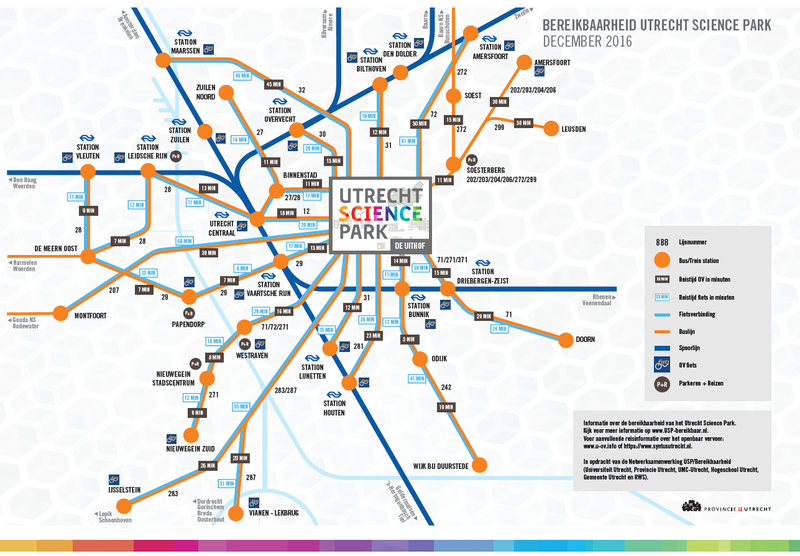 Utrecht Science Park can be accessed using public transport via an extensive network of bus routes. Bus lines 28 (through the city centre) and 12 (the most direct route from Utrecht CS) are categorised as ‘high-quality public transport’, which means that the service is high frequency and the buses have capacity for more than 100 people. There is also an extensive network of local and citywide bus routes which mainly serve peak-hour traffic. Utrecht Science Park is served by a total of 21 bus lines, making it the best connected district in the Netherlands with direct connections to Almere, Amersfoort, Bilthoven, Driebergen/Zeist, Houten, Nieuwegein, IJsselstein, Vianen and Maarssen. Bolognalaan (night bus lines 412, 477). Bus line 12 is the busiest in the Netherlands, with approximately 23,000 users per day. This line will be replaced by the Uithoflijn, the first tramline in a new regional network. Although work has already begun on the construction of this line, it will not carry its first passengers until 2018. Meanwhile, Utrecht Science Park will continue to be connected to the railway network via bus lines 28 and 12, which run at a maximum frequency of about 20 services per hour. You can plan your trip via NS.nl and 9292.nl or visit U-ov.info for information on all public transport in Utrecht.